Astronauts and space travel often seem futuristic, but the first lunar landing was more than 40 years ago; it is a part of history. This poem for kids by Paul Perro celebrates the first ever visit to the moon, mankind's most amazing achievement. Man wondered for many years what it was like on the moon, and in 1969 NASA sent a team of highly trained astronauts to find out. 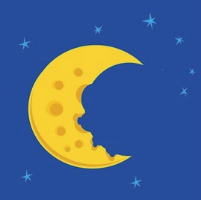 This poem imagines instead, that Uncle Sam sent two young boys there, called Neil and Buzz, to settle an argument about whether the moon is a giant face, or made of cheese. It is perhaps not the most historically accurate poem on this site, but if you read it carefully you will see that many of the main elements of the real story are there, and it serves as an introduction to the real story. It's fun too. To find out what really happened on the Apollo 11 mission, scroll down past the poem. There were two boys called Neil and Buzz. And this is what it was. 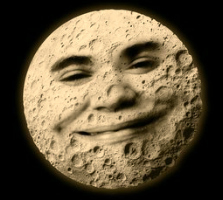 "I think the moon's a giant face"
The moon is made of cheese!" But Neil said "No you're not, I am!" To ask their Uncle Sam. Up to the moon and find out!" And they turned on the ignition. But the stairs were really quite steep. For boys, a giant leap. It was a cold and rocky place. Was not a giant face. "This is not a fun place at all. Golf course, or shopping mall." And took lots of photographs too. And nodding, Neil said so did he. A bit like in an airoplane. Were glad to be home again. He went there on a rocket ship called Apollo 11, built by NASA (National Aeronautics and Space Administration). It included a command module called Columbia and a lunar lander called the Eagle. As Armstrong first set foot on the moon, he said the famous words "That's one small step for man, one giant leap for mankind." He actually intended to say "That's one small step for a man..." but in the excitement got it slightly wrong. Also on board Apollo 11 were Buzz Aldrin and Michael Collins. Aldrin joined Armstrong on the moon for 21 hours, while Collins stayed on board Columbia to pilot it. 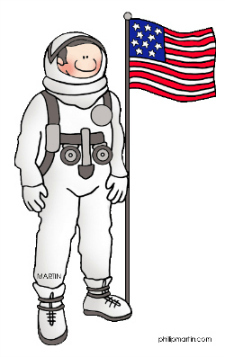 Armstrong and Aldrin planted an American flag on the moon. They returned to Earth and splashed down in the Pacific ocean on July 24. There were five more manned lunar landings between 1969 and 1972. 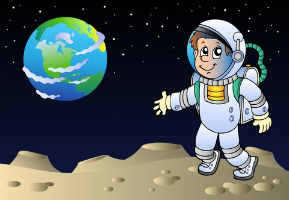 A total of 12 men have walked on the moon. In 1971 an astronaut called Alan Shepard played golf on the moon.